What should Lina have done? She should have waited in the woods, out of sight of the lane, until the enemy creep wave had passed (so that she didn't draw aggro from them), and then emerged into the lane behind the Death Prophet, and started right-clicking her. 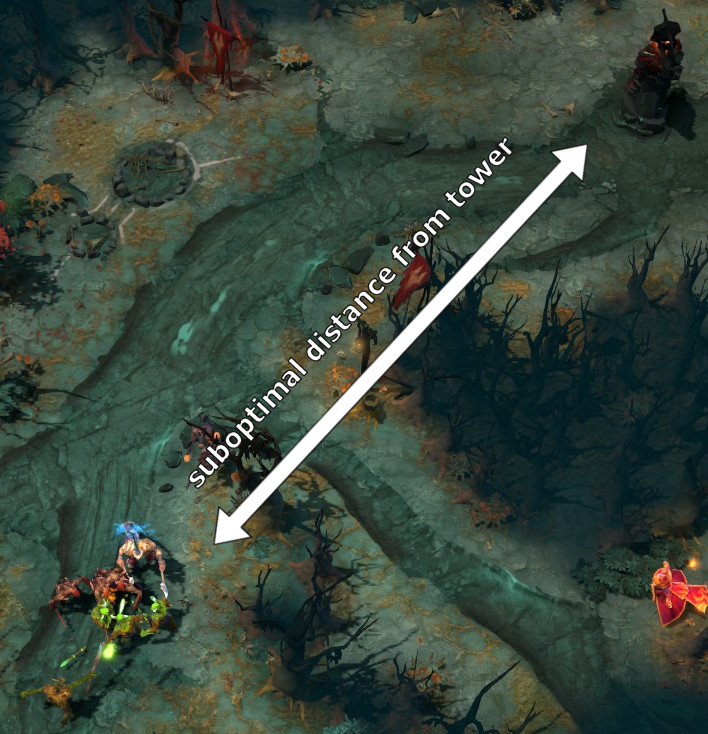 Trading hits is fine (Lina should have bought adequate regen), and the outcome will be that the Lina zones the Death Prophet: that is, Death Prophet is made to retreat back under her tower, outside of XP range. 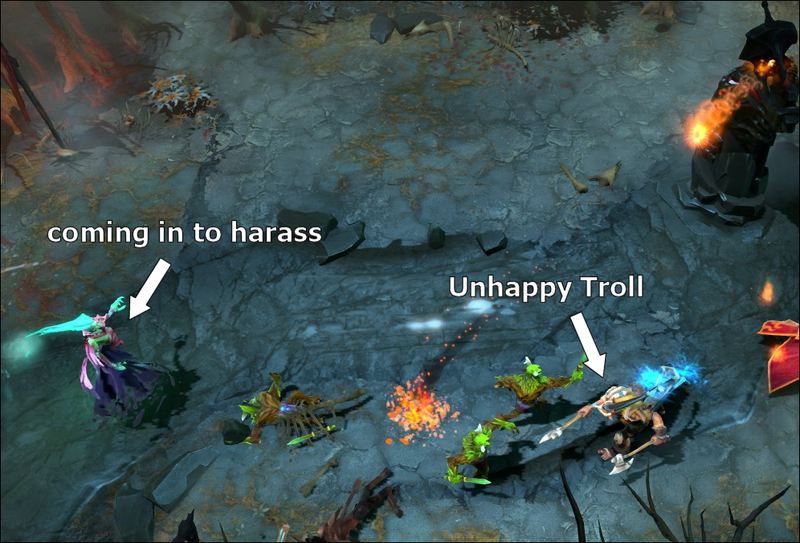 If Death Prophet were to stay in lane with low hitpoints then Troll + Lina will be able to kill her, so she has to hide. Once Death Prophet has been beaten back Lina can stand between her and the creep line, keeping her from gaining levels. Note that Lina has to dodge out of the lane as each new creep wave arrives, so as not to interfere with it, but can then return behind it again to keep Death Prophet from getting anything. 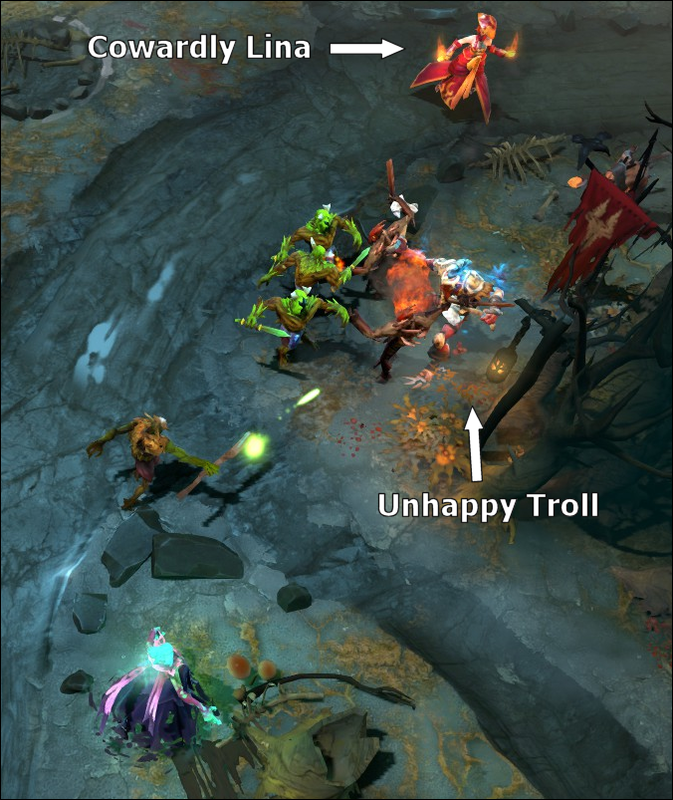 In this situation Lina can stand far enough from the creep line so that she doesn't take XP (giving Troll solo XP will power him up quickly), or she can stand close enough so that she does split the XP. It's fine to take XP from Troll as long as they are both getting more out of the lane than Death Prophet is. 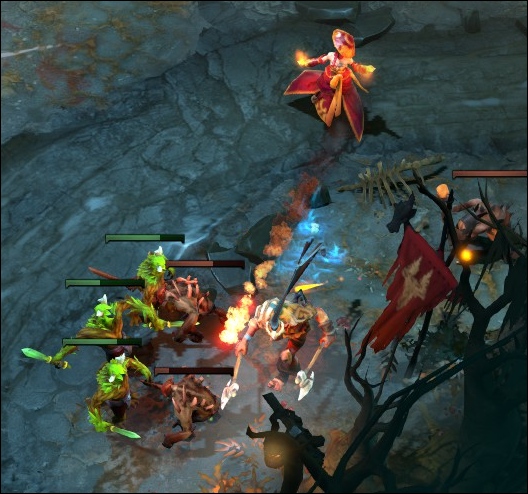 If the Lina is good she may be able to use windows when Death Prophet is absent to stack nearby camps. 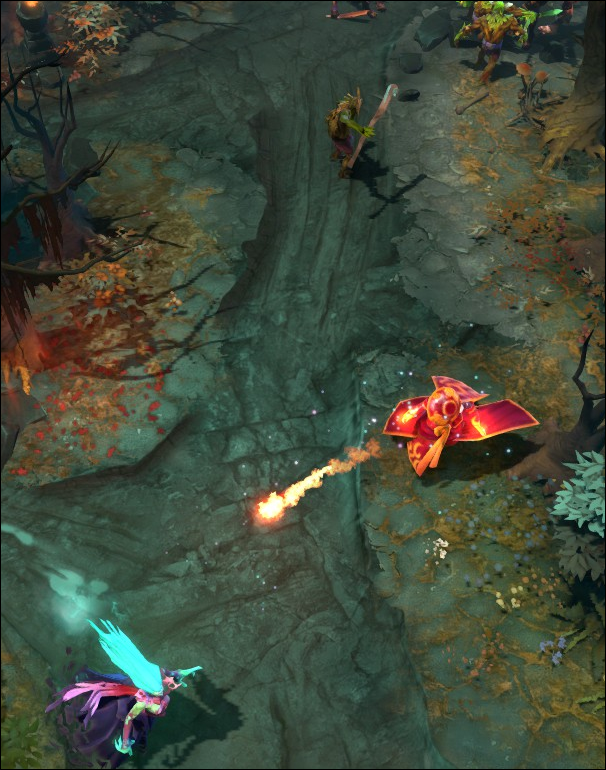 By zoning Death Prophet the Lina will end up under-levelled, but the Death Prophet will be much more under-levelled. Once the Troll has powered up enough, he can go spend some time in the jungle, leaving Lina to get solo XP and farm in the lane. It may not be apparent from the screenshots above, but Dire is actually running a trilane here. Where then is Crystal Maiden? She's warding bot. Having a ward covering the bot rune isn't bad, and it gives some protection to the solo offlane from mid ganks, but crucially Crystal Maiden didn't have to be here to do this: she could just have given the offlane hero a ward in the fountain and let them place it themselves (hold ctrl and use the ward on your allied hero to split the stack and give them one ward from it, keeping one for yourself). 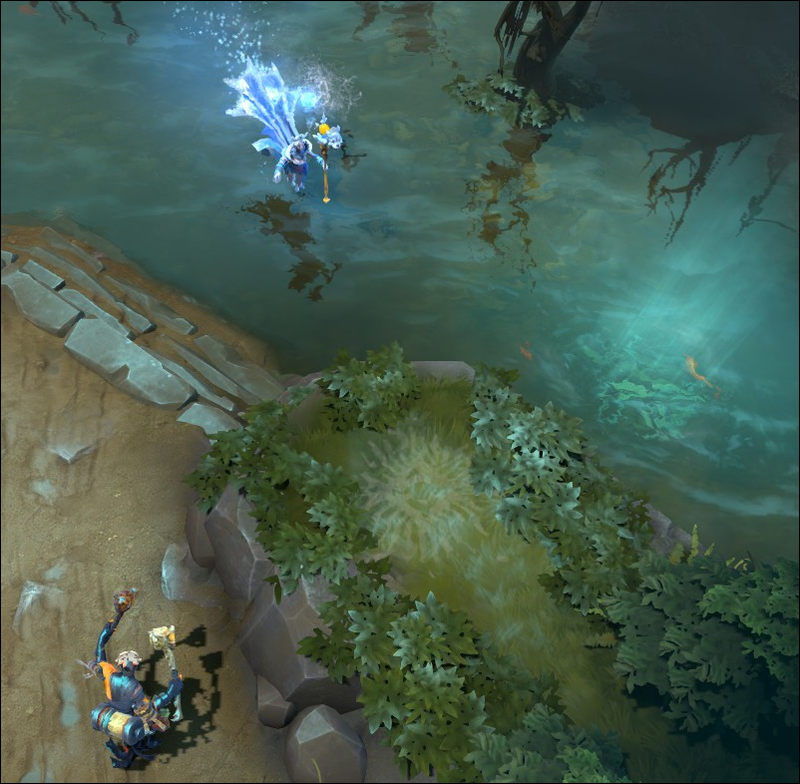 Imagine Crystal Maiden had been with Lina as the creep waves initially met, hiding in the woods. Death Prophet came all the way up to the creep line; Frostbite into Light Strike Array with all three heroes right-clicking would have been the easiest First Blood in the world, comfortable enough to finesse the kill onto the Troll. This would have practically won the lane on it's own: Death Prophet would get nothing out of it (if she ever came back near it she would die again), and a free-farm Troll is a happy Troll. After the kill Crystal Maiden can stick around nearby, stacking camps or jungling with Frostbite. If Death Prophet shows her face again they can repeat the kill. Once it's clear that Death Prophet isn't going to come back (a sensible player won't), Crystal Maiden can go roam and/or jungle. Of course, for this to have happened she had to have been in lane as the game began, instead of being half-way across the map. A lot of supports think they can help their carry out by denying creeps for them. It's harsh to criticize someone for trying to be helpful, but this is almost always detrimental; the carry will be trying to maintain creep equilibrium. That is, they will be trying to hold the creep line in a specific place, near their tower but outside its range. By hitting their creeps the support will generally by doing something which (a) the carry has no trouble doing themselves, (b) interferes with the balance of the creep line which the carry is trying to maintain, and (c) might throw of the timing of the carry's swing. The only time a support in lane next to a carry should be denying creeps is when they are actively trying to drag the line back nearer their tower, in which case all allies in the lane should be attacking their creeps as soon as the creeps get to half-health or lower. Except in that circumstance, supports should leave the creeps alone. As an aside: when a support is harassing the enemy hero(es), they need to be careful not to do it within aggro range of the creep line. If they take aggro on to themselves they will likely cause the lane to push. The Stack-Pull and Chain-Pull (and also Single-Pull) are important tools in the support players arsenal, techniques which they need to learn. Equally important to knowing how to pull, though, is knowing when to pull, and when not to. Here Crystal Maiden has stacked the pull camp and is pulling with it. 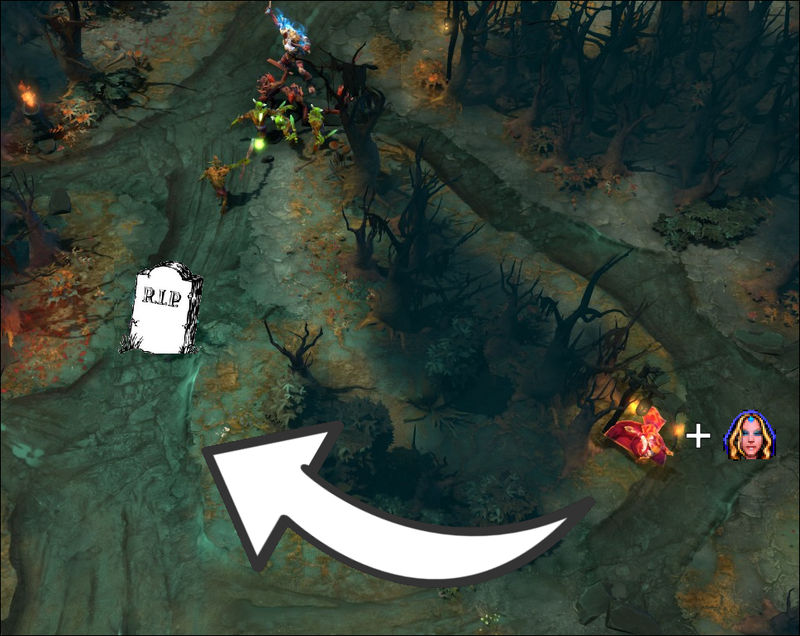 However, the creep line was already in the perfect place: Troll was holding it just outside of tower range where it is very safe to farm, with no disruption to his last-hitting. By pulling here Crystal Maiden forces the Troll to have to last-hit under tower, inevitably resulting in some missed CS and likely pushing the lane. Last hitting under tower is full of excitement. A good support will use a Stack-Pull or Chain-Pull to pull a pushed lane back nearer their tower: it is a recovery mechanism for when their lane becomes pushed out. It should not be used when the creep line is in the correct place already. Communication can solve this issue. It's good to have the >Pulling Creeps chat message assigned to the wheel, or bound to a key (the command is "chatwheel_say 50"). If the support lets the carry know what they intend then the carry can respond if they don't want it to happen. In fact, with good coordination, the carry can start pushing the lane, allowing the support to perform the pull and get some farm, while keeping the creep line out from under the tower, but they can only do this if they have some warning. Follow these handy tips for improved lane performance! Standard Dota disclaimer applies (There's An Exception To Everything In Dota).